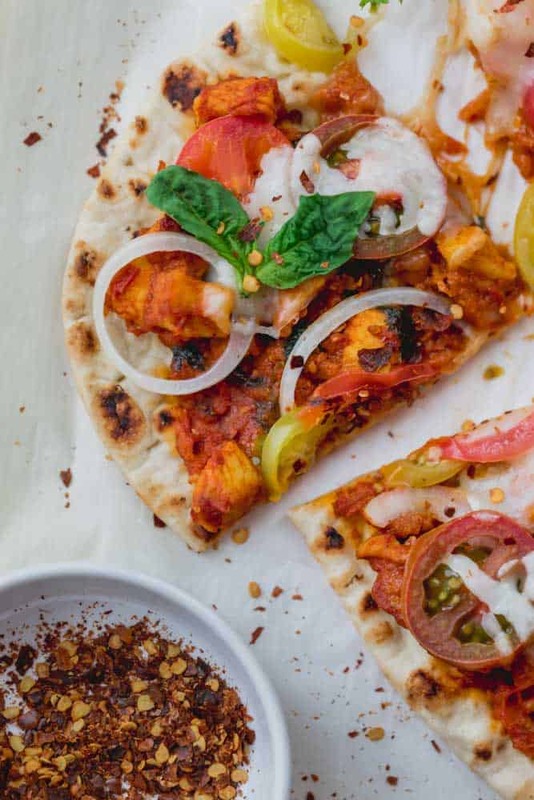 This Tomato Garlic Chicken Naan Pizza is a recipe I tried from the Meatballs and Masala cookbook by Asha Shivakumar. 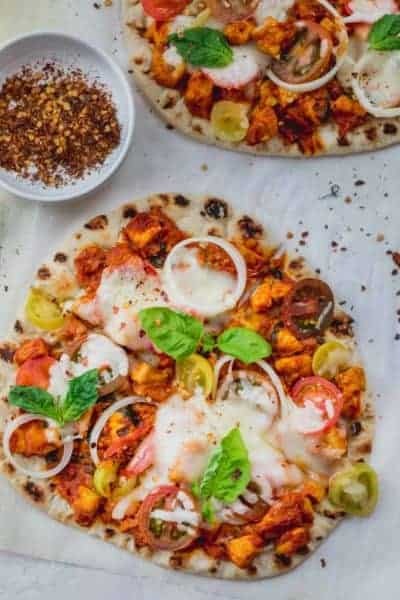 It uses naan bread as the base for the pizza and it's topped with a basic chicken masala, onions, tomatoes and fresh mozzarella. It will definitely get you out of your pizza rut! 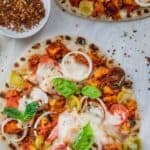 One of my dear blogger friends who runs the Food Fashion Party blog, just released a cookbook that is full of incredible India dishes with an American twist. 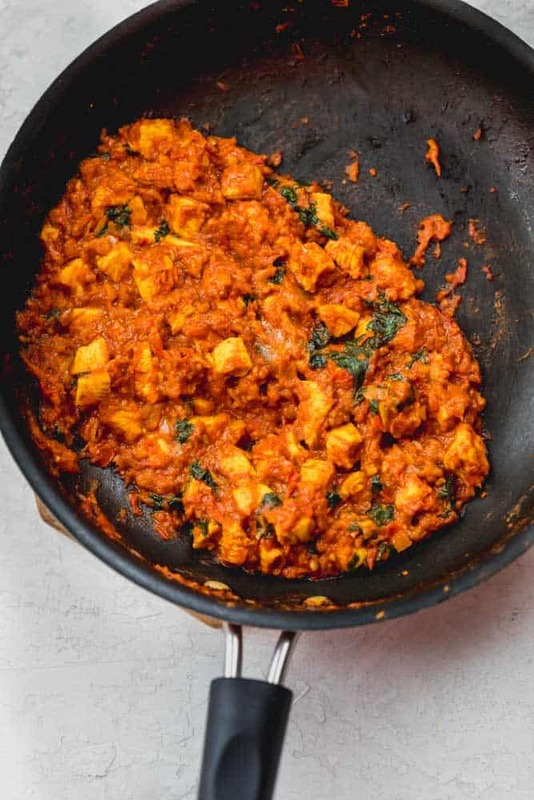 It’s called Masala and Meatballs…so clever! 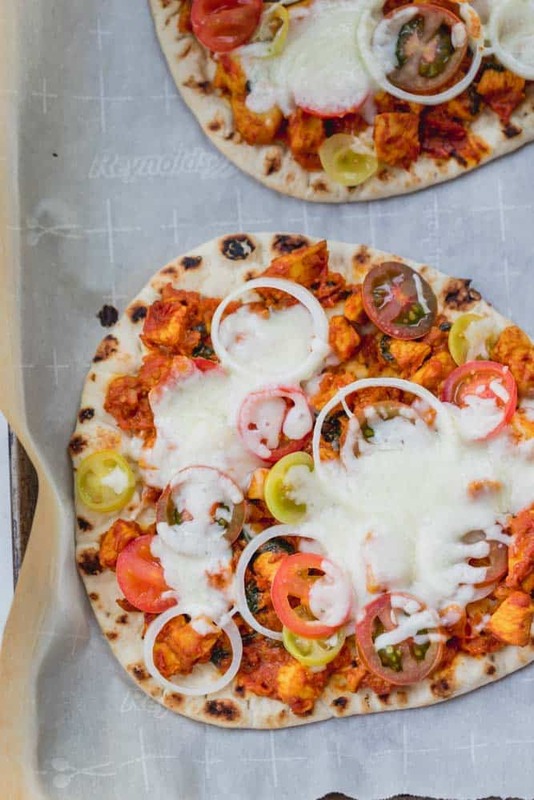 I tried the tomato garlic chicken naan pizza from the cookbook because her photo was so drool worthy! I attempted to do it some justice and although my photos don’t rival hers, the taste probably comes super close…it was unbelievably amazing! One thing you can say about Indian dishes is that they never disappoint in the flavor department! Her tomato garlic chicken naan pizza recipe called for 10 garlic cloves just to make the sauce and at first I thought whoa!! But I trusted it and it was impeccable. I made half the sauce serving for only 2 naans. I used garlic, tomatoes and onions, then cooked it with chicken, tons of spices and cilantro to look like this. That became the sauce and heartiness of the tomato garlic chicken naan pizza and then I topped it with mozzarella cheese, tomatoes and onions. And then I added some basil and crushed red pepper. It was a flavor bomb in my mouth and I definitely ate…err..inhaled…an entire one on my own. It’s a personal pizza, ok? Check out her amazing new cookbook on Amazon if you’d like to try new flavors and dishes like this one! In a blender, combine the garlic, onions, tomatoes and blend to a smooth paste. Heat the oil in a pan, add the tomato mixture, chicken and spices, and cook until the liquid dries and the chicken is completely cooked, about 15 minutes. Uncover the pan, add the milk and cilantro and stir to combine. Preheat the oven to 500°F and line baking sheet with parchment paper. Scoop half the chicken mixture on top of the naan. Add mozzarella cheese, and top with tomatoes and onions. Bake in the preheated oven for 5-7 minutes until the mozzarella melts. Remove from the oven, top with crushed red pepper and fresh basil. If you don’t have one of the spices like garam masala, it’s Ok to substitute it for more of another spice or curry.